From there you departed to the great Father of all. This Saint was during the reign of Constantine the Great (306-337), and was the son of Dometius. Dometius was the brother of Emperor Probus (276-282) in Rome, and he gave birth to two sons named Probus and Metrophanes. With sensible and right thoughts, he contemplated the religion of the idols, how it is false and delusional, and therefore entered into the true faith of Christ. He went to Byzantium, and dwelled there together with Titus, the Bishop of Byzantium, who was a holy and God-bearing man. When he saw Metrophanes was adorned with virtues, he numbered him among the clergy, making him a Reader. After the death of Saint Titus, Dometius, the father of Saint Metrophanes, became the Bishop of Byzantium. When Dometius died, his son Probus became the Bishop, who having governed the Church for ten years, departed to the Lord. Immediately after this Saint Metrophanes, the brother of Probus and son of Dometius, was elevated to the throne of Byzantium. When Constantine the Great found the divine Metrophanes to be the Bishop of Byzantium, he contemplated his virtue, his fair dealing in judgment, and the holiness he had. Therefore it is said, that he not only loved the land of Byzantium, for its good position, for its mildness during the four seasons of the year - namely spring, summer, autumn and winter -, for being a place that produces a rich amount of fruit, for welcoming and serving like two hands by land and by sea, for being the place where two continents meet - namely Europe and Asia -, but Constantine the Great loved Byzantium no less for the virtue and holiness of the divine Metrophanes, who was Bishop there. Therefore he was generous to this land, and without making the expenses more expensive, he built the wondrous and great city of Constantinople, which has been victorious and exceeded every other city of the ecumene, and there he established the capital of his empire, moving it from old Rome. When the Holy and Ecumenical First Synod gathered in Nicaea in the year 325, the blessed Metrophanes, due to old age and illness, was unable to appear in person at the Synod, and was bedridden, because the natural strength of his body was wasting away. For this reason he sent a deputy to the Synod, his Protopresbyter Alexander, an honorable man, to whom he left the throne as a successor in the year 330. At the conclusion of the Synod, Constantine the Great returned to Constantinople together with the God-bearing Fathers, at which the divine Metrophanes said it was revealed to him by God, that the successors to the throne of Constantinople were to be Protopresbyter Alexander and after him Paul, as it was pleasing to God, and they were worthy of the patriarchal office. * Therefore the blessed Metrophanes reposed, and departed to the Lord. His Synaxis and Feast is celebrated in the most-holy Great Church, and in his revered Temple, which is near that of the Holy Martyr Akakios at Eptaskalo, where his honorable and holy relic is located as well. 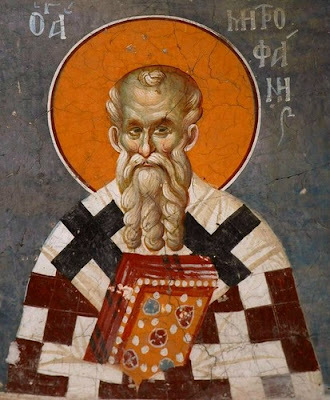 The see of Byzantium, whose foundation was ascribed to Andrew the Apostle, was originally a common bishopric, who was known as the Bishop of Byzantium. It gained importance when Emperor Constantine elevated Byzantium to a second capital alongside Rome and named it Constantinople in 330. It is said that at the First Ecumenical Synod in 325, the Bishop of Byzantium was elevated to an archbishopric, making Metrophanes the first Archbishop of Byzantium. The see's ecclesiastical status as the second of five Patriarchates were developed by the Ecumenical Synods of Constantinople in 381 and Chalcedon in 451. At the time of the First Ecumenical Synod in 325, Metrophanes was already a man of one-hundred seventeen years and unable to participate in the work of the Synod, so he appointed Alexander his Choriepiscopos as his representative. After the Synod, the emperor invited all the Fathers to visit the ailing and aged archbishop. When the emperor asked him whom he wished to name as successor to the patriarchal throne, Metrophanes named Alexander. Following that he said to Alexander of Alexandria: "O brother, you will remain my most worthy successor." 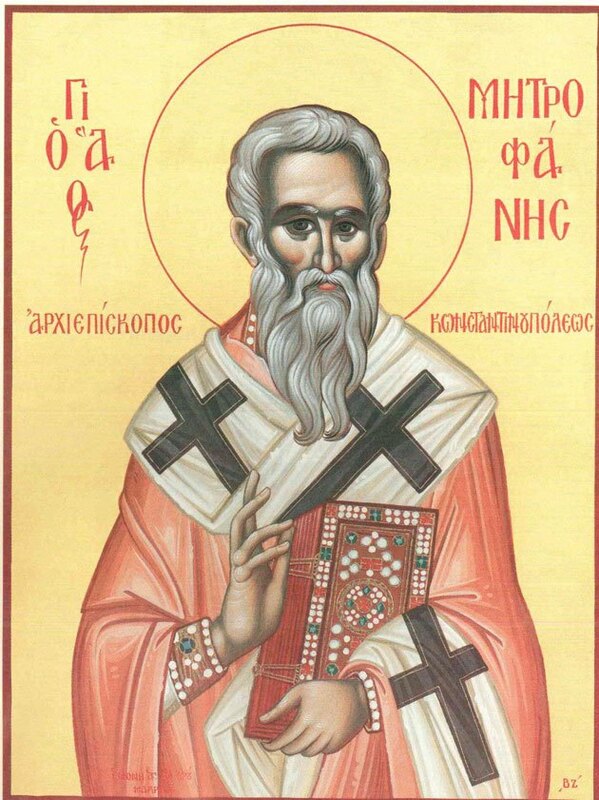 He then took the hand of Archdeacon Athanasius (later Athanasius the Great and Patriarch of Alexandria) and praised him before all. After this, it is said Metrophanes reposed ten days later. O good shepherd, thou didst proclaim the great mystery of the Trinity, and manifest Christ's dispensation to all. Thou didst put to flight the spiritual wolves who menaced your rational flock, and didst save the lambs of Christ who cry: Glory to Him Who has strengthened thee; glory to Him who has exalted thee; glory to Him Who through thee has strengthened the Orthodox Faith. Thou didst proclaim the faith of Christ by thy words, and by thy life thou didst increase Christ's flock to a multitude. Now thou dost rejoice with the Angels, and art ceaselessly praying for us, O Metrophanes.